The presentation of food on the banquet table is nearly as important as the menu. 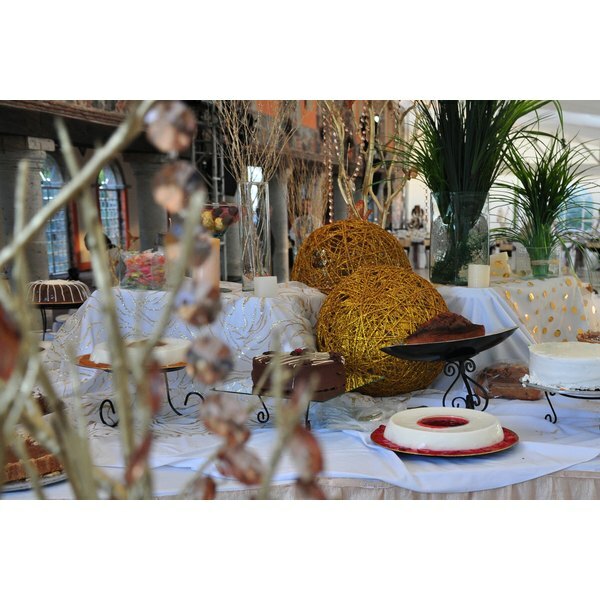 A well-laid table showcases appetizers, sides, main courses and desserts while also being accessible to the guests. Taking measure of how traffic will flow and how easily guests can navigate the tables are also important considerations in banquet table display. A rectangular banquet table, with food laid out from main course to dessert, is the standard. 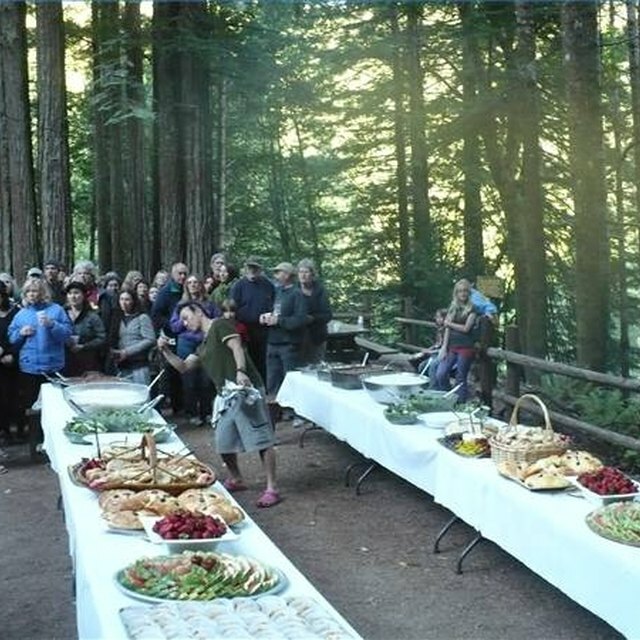 Servers can be employed to serve plates as guests file past, or it can be served as a buffet. If a large number of people are expected and you want to serve buffet style, set the table using mirrored plates. This means two of the same dishes are placed opposite each other. This allows guests to use both sides of the table for quicker service. For intimate affairs with a smaller guest list, a circular table is a pleasant change from the standard, but that is difficult for large meals or crowds. Round tables work well for light appetizers and desserts. They don't work so well for full-course meals because of crowding and a little confusion about where people should start once the line gets moving. Placing the food at different heights will make a visually appealing table and can be done whether you use a rectangular or circular display. This method works particularly well with round tables, better utilizing the middle space so guests don't have to reach over other dishes to get at the crab cakes. Create the platforms by using small boxes, crates or anything that will be sturdy underneath the tablecloth. A stack of books or even overturned cooking pots can be used. Remember, these will be covered by a tablecloth so as long as they can hold the platter, it won't matter what it looks like. Foods that are elevated should be finger foods and not something your guests need to cut, like cheese. This helps to take away the danger of having the platter flip off the platform, which would be embarrassing for everyone involved. You also don't want to place anything hot, like soup, on any elevation as it could spill, creating a dangerous situation. Fill in the gaps in between your food dishes with decorations. You can use food such as small bowls of fruit and nuts or non-food arrangements like seasonal flowers, branches of cedar or bunches of lavender or chamomile. Using styles of containers other than decorative service bowls or vases will make your banquet table stand out. Using small pails, wicker baskets, doll-sized chairs or old-fashioned milk jugs for vases are some ideas. You do want to leave some room along the table for guests to put their plate or glass down while they are serving themselves a portion that requires two hands. Walk along the banquet table with this in mind and note any places that would seem most logical to leave space along the way.